Traderoot Africa is the regional sales and support subsidiary of Traderoot Technologies, a FinTech software company based in Cape Town. Traderoot Africa has offices in Johannesburg, Cape Town and Windhoek, and its role is to support and engage with new and existing clients on the African continent, bring new clients on board and provide third-line product support for the software. Traderoot’s software is licensed to customers, who range from some of the largest financial institutions in the region to end-user point-of-sale merchants. As an example, clients like Metropolitan Momentum Insurance (MMI) use a Traderoot Core Account solution to manage account balances and account holder profiles, including the collection of fees. MMI’s Core Account system integrates with their health insurance system, their customer-facing structures and their accounting systems. Old Mutual uses a custom Traderoot solution to aggregate transactions and calculate interest on their Old Mutual Money Account and Retail Mass 2-in-One Savings Plans. Traderoot software underlies much of the transaction switching and routing between retail merchants and banks in the region. Major payment service providers (PSPs) and their merchants are using Traderoot software, including Innervation, Sureswipe and Dashpay. In Namibia, Traderoot software is used by Namclear, the national payment clearing house, to route transactions among the country’s banks and provide inter-bank settlements. Furthermore, NamPost licenses a suite of four Traderoot solutions to meet all their business requirements, from biometric authentication to paying bulk salary payments, and managing proof of life for the Government Employees Pension Fund (GEPF). Some of the other Traderoot clients in the Southern African region are the Botswana Building Society (BBS) and NASCU, a Zambian financial inclusion initiative sponsored by Mastercard. 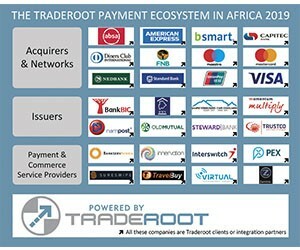 The FinTech solutions available from Traderoot Africa include two forms of PSP software: the PSP–Channel, which aggregates transactions from a community of merchants and payment terminals, and the PSP–Acquirer, which additionally interacts with banks to settle the merchants’ accounts from their customers’ banks. The available solutions also include the Card Management System (CMS), which manages the production and issuing of cards and authenticates cardholders using PIN and biometric data. Their Universal Issuing Platform—Core Account (UIP–Core Account)—provides core banking functions such as managing customer profiles and their account balances, as well as calculating interest and collecting fees. The Electronic Value Distribution (EVD) solution manages the distribution of value-added services such as airtime vouchers and payment of bills and amenities. The Billing and Reconciliation Engine automates business-to-business functions, including transaction reconciliation and the production of invoices and statements. Traderoot Africa’s solutions, therefore, cover the entire spectrum of business requirements in banking and payment processing, and their relationship with the region’s banks ensures that their clients’ solutions are compatible and integrated with the established standards. Traderoot Africa is well-established, growing and profitable, and they are seeking strategic partners to help them accelerate growth throughout Africa in line with a clearly defined and prioritised market strategy. The Banking as a Service licensing model offers further opportunity to increase their already high proportion of recurring revenue derived from support and maintenance, and from transaction fee income from existing clients. This business model makes Traderoot Africa an exciting investment case for both capital and debt finance. Interested parties should contact the CEO. Traderoot Technologies, through its Africa operations, believes in making a contribution to the future of our country and community by sponsoring education and sporting talent in a meaningful and lasting way that empowers children to become well-educated and healthy leaders of the future. Rather than simply supporting organisations that tackle the problem of education superficially, they feel that their contribution can be made far more effectively by supporting individual children and young adults from disadvantaged backgrounds who have shown the potential for success, by providing a sustained support network that enables them to reach their goals and achieve that potential. This is the most effective way to foster and mentor genuine leadership potential in future generations. The Traderoot Active initiative is their way of achieving this aim, while encouraging people’s passionate involvement in active, constructive sporting and leisure activities at the same time. The Ride for a Child and Run for a Child campaigns bring together runners and cyclists to raise funds for education. The people who do these sports are often passionate about the activity, and they have created a platform that enables these people to fund a passion for education through the efforts of an activity that they love doing. The basis of these campaigns is that people take part in recognised provincial, national or global sporting events competing in Traderoot Active racing gear. Every kilometre they run, swim or ride is sponsored, either by Traderoot or by independent sponsors, and raises money for a charity that significantly benefits a child’s education. In addition, all the funds raised from sales of the branded racing gear go to the same charities. Traderoot has partnered with Bright Start, an educational charity that places promising children from underprivileged communities into schools with a high standard and continues to work with the child, teachers, parents and others to provide holistic support and guidance throughout the child’s educational career. Traderoot is also involved with Support SA Talent, an investment project focused on sustainable funding for talented South African athletes.